We’ve gotten used to seeing slight variations on the same festival lineups over and over, so it’s always refreshing to see a music festival that has some sense of identity. The Afropunk festival — which has grown from a Brooklyn phenomenon to one that takes place in a handful of cities around the world — has always had a sense of identity. Even as it’s moved further and further from any restrictive definition of the word “punk,” the festival has taken in a bunch of different discursive examples of music that reflects black experience, grouping them all under a single umbrella. And today, the Brooklyn version of the festival has announced its 2019 lineup. It’s a good one. 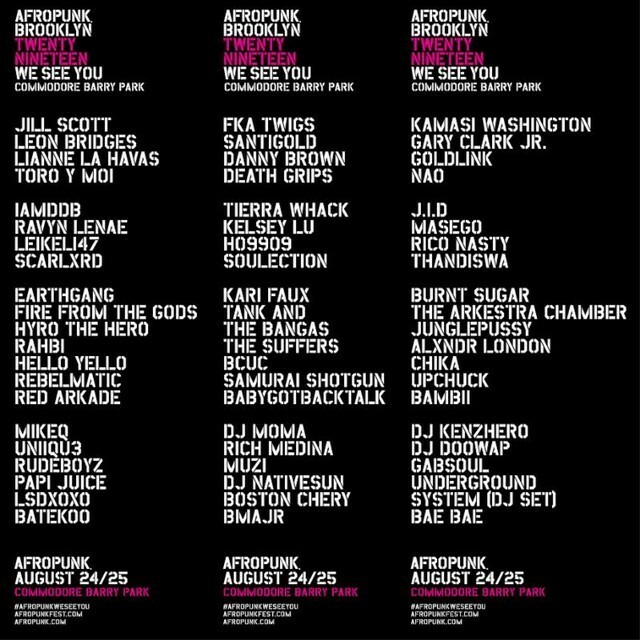 This year’s Afropunk Brooklyn festival is coming to Commodore Barry Park 8/24-25. FKA twigs, who really doesn’t play enough shows and who has gone a long time without releasing music, is one of the headliners. That’s a good thing since she’s a great performer, and it’s also a good thing because hopefully it means she’s got something new on the way. (The M3LL155X EP came out way the hell back in 2015, and LP1, her sole album, came out a year before that.) Twigs will share headliner duties with Jill Scott, the veteran neo-soul powerhouse, and Kamasi Washington, the astral jazz traveler. The rest of the bill also features genuine famous people like Leon Bridges and Gary Clark Jr., and it cuts a wide swath across a whole bunch of genres. Santigold, Danny Brown, Death Grips, GoldLink, Lianne La Havas, Toro Y Moi, Nao, Tierra Whack, J.I.D, Rico Nasty, Ravyn Lenae, Leikeli47, Earthgang, Kari Faux, Junglepussy, and many others are slated to perform. Check out more info here.